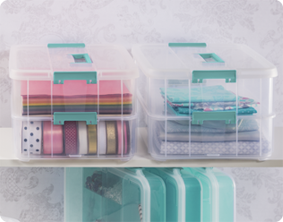 Need help keeping small items neat, organized, and contained? 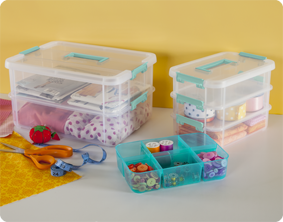 The Stack & Carry 2 Layer Handle Box is an ideal storage solution for crafting, sewing, beauty products and office / school supplies. Color accent latches securely lock layers into place and allow individual layers to be removed easily for quick access to items enclosed. Each layer accommodates 8 ½” x 11” paper, making it ideal as a school, office or countertop organizer. Store scissors, paintbrushes and pencils, scrapbooking items, make up, first aid items, and more. The handle on top allows this storage solution to become portable, and simplifies transport of the supplies you need on the go! The overall dimensions of this item are 14 3/8" x 10 3/4" x 7 5/8". Overall Assembled Size: 14 3/8" x 10 3/4" x 7 5/8"
Perfect for keeping all your project supplies contained in one place, with a handle to easily bring it with you. Each layer is sized perfectly to fit 8½" x 11" paper and other supplies like paint brushes, fabric, patterns, ribbon, and more. 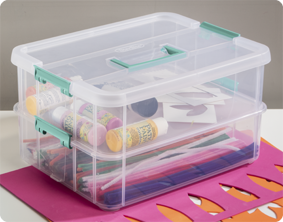 Perfect for storing craft supplies, makeup, jewelry, small tools, office supplies, and more. 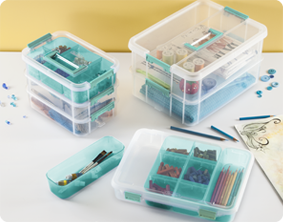 Stack & Carry Organizers are available in two sizes to solve a variety of storage challenges! Check out our other Divided Storage options too! 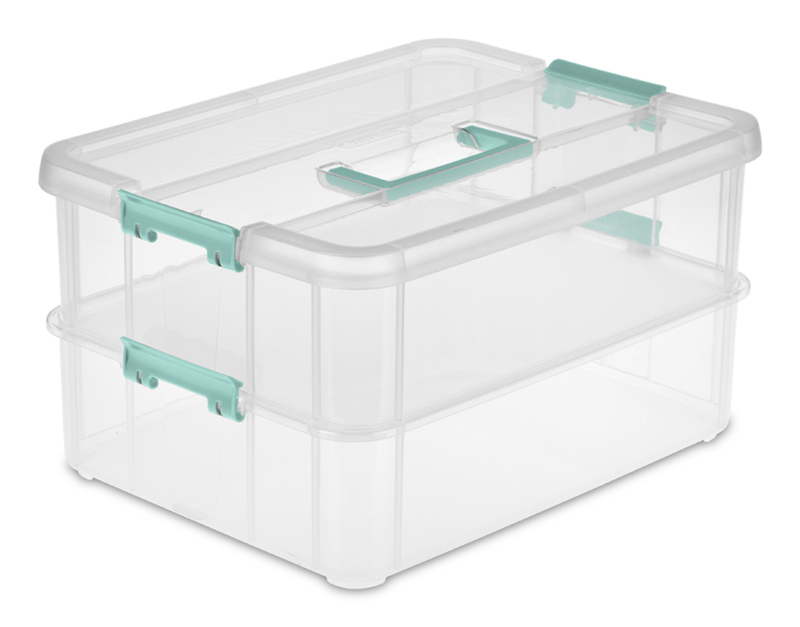 Stack & Carry 2 Layer Handle Box is rated 4.9 out of 5 by 10. Rated 5 out of 5 by honey from convienence of two areas to seperate items I recently had to make a trip with some important documents and small items. Due to the nature of the items I needed two separate areas but wanted them to be together still. This container was perfect! It kept the items clean, dry, separated but easily grabbable to get everything at once for easy presentation. I will be purchasing a couple more of these containers as i loved the versatility of use. Rated 5 out of 5 by Tonya1026 from Love the size I love this product and have it in with the handle in green (which I prefer over the blue). I use this with my scrapbook supplies. The top bin has ink pads and some stamps while the bottom holds my plates for my Cuttlebug along with severa embossing folders. Rated 5 out of 5 by Chrissy from I Love the Stack & Carry I have maybe a dozen of these. I love them. All my kids cards & color pages they have made for me over the years store nicely in them. So many uses! I have cleaned up my work room using these containers. I can not wait to get more! Rated 5 out of 5 by Hamgirl from Stack Multiples! I use these boxes to sort and store my embroidery threads and sewing thread spools. They are the perfect height for mini king spools of threads. I sort by color and these boxes make it super simple to grab the box I need. They are also great if you are a quilter and go on a retreat to take threads and fabrics in one and your tools for cutting in the other. The boxes have little feet on them so they can securely stack on top of another 1422 unit. These are perfect storage! Rated 5 out of 5 by dipyeroche from Medicine I've been effected by the flood water and have used these to store our medicine and other supplies in. Keeping them up high and dry. Rated 4 out of 5 by JBodick from Lost of storage space I use it for my finger nail polish. It has lots of room for polish and other items used for manicures and pedicures. Rated 5 out of 5 by PattyInCC from Coloring Books and Construction Paper I am using one of these boxes for coloring books and construction paper. They fit great and the little ones can open and close them. Not to mention, see what is in them so they are not searching through multiple boxes. I also have one with cold and flu related items that I keep filled and hidden away. When you are sick you really appreciate containers that open and close with ease. I cannot wait to purchase a few more for craft supplies. 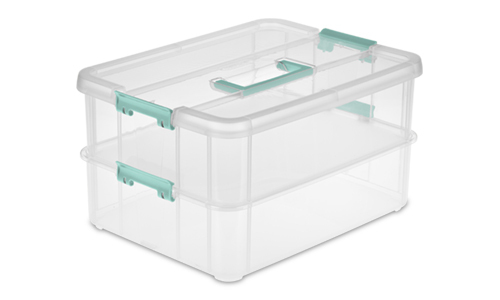 Rated 5 out of 5 by Cin D from PERFECT size for storing Nail polish and nail tools! I was looking for something deep enough to put my nail polish in and this is perfect! The nail polishes all go in the top half and the files, cotton, polish remover, callus removers, ped files and whatever - go in the bottom. It is sturdy and clips together securely for transport. You can take the whole mobile kit where ever you want and there is no wasted room above the bottles. I used the long, narrow little baskets in the top half so the bottles stay exactly where I want them, in color order, and do not slide around or tip over. Try it if you are a nail polish connoisseur or just want the perfect solution for what you have!